Battleship is a 2012 American military science fiction action film that is loosely based on the board game of the same name. The film was directed by Peter Berg and stars Taylor Kitsch, Brooklyn Decker, Rihanna, Tadanobu Asano, Alexander Skarsgård, and Liam Neeson. Filming took place in Hawaii and on USS Missouri. In the film, the crews of a small group of warships are forced to do battle against a naval fleet of extraterrestrial origin in order to thwart their destructive goals. Battleship premiered in Tokyo on April 3, 2012 and received a wide release by Universal Pictures on May 18 2012. It received mixed to negative reviews and underperformed at the box office, making only $65 million in North America against its total gross of $303 million worldwide. In 1996, the distant Gliese planetary system is discovered to have a potentially habitable planet and a communications array is built by NASA in Hawaii to send a transmission to contact any intelligent life. Meanwhile, Alex Hopper is arrested while attempting to impress Sam Shane. His brother, naval officer Stone, forces Alex to join the U.S. Navy in order to improve his life. In 2012, Alex and Sam are in a relationship; Alex serves as a Tactical Actions Officer as a lieutenant aboard USS John Paul Jones while Stone is the commander aboard USS Sampson, but Alex is in danger of receiving a disciplinary discharge. During the 2012 RIMPAC exercise, five alien spacecraft arrive. Their communications ship collides with a satellite and crashes in Hong Kong while the other four land in the waters off Hawaii. Sampson, John Paul Jones, and their Japanese sister ship JDS Myōkō are ordered by Admiral Terrance Shane to investigate, and they discover a floating structure. When it is touched by Alex it generates a force field that encloses the Hawaiian Islands and separates the three ships from the RIMPAC fleet, and jams all radar and communication equipment in it. Three alien warships surface and in the ensuing engagement, the Sampson and Myōkō are both destroyed, resulting in Stone's death, while the command crew of John Paul Jones are killed. With Alex assuming command of the ship as the ranking officer, they recover the survivors from Myōkō including its commanding officer, Captain Yugi Nagata. The aliens also launch drones to attack Hawaii which cause heavy damage. On Oahu, Sam is accompanying retired U.S. Army lieutenant colonel and double amputee Mick Canales on a mountain hike. After becoming aware of the aliens' presence, they encounter scientist Cal Zapata who informs them the aliens have taken over the communications array, and Mick determines that they are planning to use it to re-establish military communications with their home planet. Aboard John Paul Jones, naval personnel capture a semi-conscious alien. The alien forms a telepathic link with Alex, showing him their history of destroying worlds. Other aliens arrive and retrieve their comrade, but are prevented from sabotaging the ship. Examination of the captured alien's helmet reveals the aliens are sensitive to sunlight. Ashore, Sam, Nick and Zapata recover his spectrum analyzer from the aliens and they use it to radio John Paul Jones to inform them the aliens intend military telecommunication with their home planet in four hours. As night falls Captain Nagata suggests to use National Oceanic and Atmospheric Administration's tsunami warning buoys around Hawaii to track the alien warships. This allows John Paul Jones to destroy two of them. At dawn, they lure the remaining warship eastwards as Alex and Nagata shoot out its bridge windows, blinding its crew and allowing John Paul Jones to destroy it, but John Paul Jones is subsequently sunk by alien drones. The survivors return to Pearl Harbor and commandeer the previously decommissioned World War II battleship USS Missouri with the aid of the retired veterans preserving her, restoring her to battle readiness and confronting the floating structure, revealed to be a giant mothership. Missouri is able to severely damage the mothership and disable the force field, and Admiral Shane scrambles a flight of Royal Australian Air Force Boeing F/A-18 fighter jets from aircraft carrier USS Ronald Reagan. Meanwhile, Sam, Mick and Cal attempt to stall the aliens at the communications array. As the mothership rallies against Missouri, Alex uses their last shell to destroy the communications array. All hope is lost for Missouri and those aboard until the Australian fighter jets arrive in time and destroy the mothership, saving Missouri and eliminating the alien threat. A ceremony is held to honor the military personnel, where Alex is promoted to lieutenant commander and presented with both a Silver Star and his brother's posthumous Navy Cross. After the ceremony, Alex asks Sam's father Admiral Shane for her hand in marriage. The admiral refuses, but shortly after, referencing how Alex and Sam met, invites Alex to lunch to discuss the matter. In a post-credits scene, three teenagers and a handyman in Scotland discover a crashed alien pod. When they open it, an alien hand reaches out, and they run off in terror. Taylor Kitsch as Lieutenant Alex Hopper, an undisciplined U.S. Navy Weapons Officer assigned to USS John Paul Jones. Liam Neeson as Admiral Terrance Shane, Commander of the U.S. Pacific Fleet and father of Samantha Shane. Alexander Skarsgård as Commander Stone Hopper, Alex's older brother, Commanding Officer of USS Sampson. Rihanna as Petty Officer Cora Raikes, crew mate and a weapons specialist on USS John Paul Jones. Brooklyn Decker as Samantha Shane, a physical therapist and Alex Hopper's girlfriend. Tadanobu Asano as Captain Yugi Nagata, JMSDF, Commanding Officer of JDS Myōkō. Gregory D. Gadson as Lieutenant Colonel Mick Canales, a U.S. Army combat veteran and double amputee. Adam Godley as Dr. Nogrady, the scientist leading the Beacon program. Peter MacNicol as the U.S. Secretary of Defense. Alexander Skarsgard, Brooklyn Decker and Peter Berg promoting the film at WonderCon 2012. Battleship was to begin filming in Australia's Gold Coast in 2010, but the production company changed location due to a lack of Australian government tax incentives and a high estimated budget of $220 million. Filming took place in the United States on the Hawaiian islands of Maui and Oahu, as well as in Sherman Oaks, California to do a few apartment scenes and in Playa del Rey, California where they filmed a driving scene along with a shootout. Further filming was done on USS Missouri. Some scenes were also filmed in Baton Rouge, Louisiana. The Science & Entertainment Exchange provided science consultation for the film. A Kongō-class destroyer of the Japan Maritime Self-Defense Force also appeared in the film. Jeremy Renner was originally considered for the role of Hopper, but the actor chose to star in a Paul Thomas Anderson drama filming at roughly the same time. In April 2010, it was reported that Taylor Kitsch had been cast as Alex Hopper, Alexander Skarsgård played his brother Stone Hopper, Brooklyn Decker stars as Sam, Hopper's fiancee and Liam Neeson as Admiral Shane, Sam's father and Hopper's superior officer. Barbadian R&B singer Rihanna makes her acting debut in the film, as a sailor. In an interview with GQ, Berg explained how he came up with the idea to cast her. He realized she could act after her appearance on Saturday Night Live. She accepted the role because she wanted "to do something badass" and also because it wasn't a role too big for her to play. Tadanobu Asano also has a role in the film as the commander of a Japanese Kongō-class destroyer. Double amputee U.S. Army Colonel Gregory Gadson, who had never acted before, plays LTC Mick Canales. He was cast after Berg saw a picture of him in the National Geographic Magazine. The film marks the reunion between former co-stars Kitsch and Jesse Plemons, who previously worked together on Berg's TV series Friday Night Lights. Berg said he loves working with friends and explained he knew how comfortable Kitsch was with Plemons, "I know that he’s really good for Taylor and he makes Taylor better. So, I wrote that whole part for Jesse." He added, "I never thought of it as a Friday Night Lights reunion. I thought of it as protection, bringing a trusted family member in." U.S. Navy sailors were used as extras in various parts of this film. Sailors from assorted commands in Navy Region Hawaii assisted with line handling to take Missouri in and out of port for a day of shooting in mid 2010. A few months later, the production team put out a casting call for sailors stationed at various sea commands at Naval Station Mayport, Florida to serve as extras. Sailors were also taken from various ships stationed at Naval Station Mayport, Jacksonville, Florida: USS Hué City, USS Carney and USS Vicksburg were some of the ships that provided sailors. Working with composers often is a really frustrating experience because you speak a different language and, oftentimes, they take two or three jobs, at the same time. They're difficult and pretentious and they're tormented artists. I'm not going to name names, but most of them are. One guy who isn't is Hans Zimmer, who taught Steve Jablonsky. We had a couple of meetings and I came up with this idea. The day I met with him, I had had an MRI for my neck, and they make that really scary sound. I was like, 'I just had this MRI, and when I was in there, I was thinking about the aliens, and it was really scary.' And he was like, 'Oh, that's awesome!' He went and recorded MRIs and made music out of MRIs, and that's the theme of the aliens in our film. He is no drama, and just goes and gets it done. The score is big and awesome and scary and driving. At times, it's very simple and acoustic and touching and emotional. He's the best I've ever worked with. All songs written and composed by Steve Jablonsky except where noted. Stone Temple Pilots – "Interstate Love Song"
Billy Squier – "Everybody Wants You"
Lucky Clark – "My Lai"
The Black Keys – "Gold on the Ceiling"
Citizen Cope – "One Lovely Day"
Dropkick Murphys – "Hang 'Em High"
Carl Perkins – "Blue Suede Shoes"
AC/DC – "Hard as a Rock"
ZZ Top – "I Gotsta Get Paid"
Royal Philharmonic Orchestra – "Waltz: On the Beautiful Blue Danube"
Band of Horses – "The Funeral"
Creedence Clearwater Revival – "Fortunate Son"
Taylor Kitsch, Rihanna and Brooklyn Decker at the Battleship Australian premiere in April 2012. The film was originally planned to be released in 2011, but was rescheduled to May 18, 2012, in the United States. The film's world premiere took place in Tokyo on April 3, 2012. The event was attended by director Peter Berg, actors Taylor Kitsch, Brooklyn Decker, Alexander Skarsgård and Rihanna. Later on they initiated a Press Tour visiting Madrid, London and Cartagena de Indias to promote the film. The film earned $303,025,485, and only $65,422,625 in North America. With a budget of $220 million the film did not meet its expectations. The film opened outside North America on Wednesday, April 11, 2012, more than five weeks before its North America release, earning $7.4 million. Through Friday, April 13, the film had earned a 3-day total of $25 million. By the end of its opening weekend, it earned $55.2 million from 26 markets, ranking second behind the 3D re-release of Titanic. However, on its second weekend, it topped the box office outside North America, with $60 million. In South Korea, it achieved the highest-grossing opening day for a non-sequel and the third-highest overall ($2.8 million). In comparison to other Hasbro films, Battleship's opening in the UK (£3.76 million) was behind the first Transformers (£8.72 million), but did better than G.I. Joe: The Rise of Cobra (£1.71 million). In North America, Battleship grossed $8.8 million on its opening day (Friday, May 18, 2012), with $420,000 originating from midnight showings, and finished the weekend with $25.5 million. It settled in second place for its opening day and opening weekend behind Marvel's The Avengers. Metacritic has given the film an average score of 39 out of 100 based on 39 reviews meaning "mixed or average reviews". Rotten Tomatoes gives the film a score of 32% based on reviews from 217 critics, with a rating average of 4.6/10. The site's consensus reads: "It may offer energetic escapism for less demanding filmgoers, but Battleship is too loud, poorly written, and formulaic to justify its expense -- and a lot less fun than its source material." Megan Lehmann of The Hollywood Reporter thought that the "impressive visual effects and director Peter Berg's epic set pieces fight against an armada of cinematic clichés and some truly awful dialogue." Empire magazine's Nick de Semlyen felt there was a lack of character development and memorable action shots, and sums up his review of the movie in one word: "Miss." Many reviews criticised the "based on a board game" concept driving the film, although some, such as Jason Di Rosso from the Australian Broadcasting Corporation's Radio National, claimed the ridiculousness of the setup is "either sheer joy or pure hell – depending on how seriously you take it", while de Semlyen "had to admire [the film's creators] jumping through hoops to engineer a sequence that replicates the board game." Several compared the film to Michael Bay's Transformers film series in terms of quality and cinematic style, with Giles Hardie of The Sydney Morning Herald claiming that the movie "finds the same balance between action-packed imagination and not taking the premise seriously that made Michael Bay's original Transformers such a joyride." Andrew Harrison of Q magazine called the film "crushingly stupid". Film critic Kenneth Turan, in a review written for the Los Angeles Times, also expressed disappointment, criticizing the film's "humanoid aliens", stating that they are "as ungainly as the movie itself, clunking around in awkward, protective suits." He called the content "all very earnest", but added "it's not a whole lot of fun". Peter Travers of Rolling Stone gave the film one out of four stars, and he comment "Battleship is all noise and crashing metal, sinking to the shallows of Michael Bay's Armageddon and then digging to the brain-extinction level of the Transformers trilogy." Other critics were less harsh for Battleship: Writing for Time, Steven James Snyder was somewhat positive because he had low expectations of the film. He wrote, "The creative team behind this ocean-bound thriller decided to fill the narrative black hole with a few ingredients all but absent from today’s summer tent poles – namely mystery, nostalgia and a healthy dose of humility" and described it as "an unlikely mix of Independence Day, Pearl Harbor, Jurassic Park and The Hunt for Red October". Giving it a C+ grade, Lisa Schwarzbaum of Entertainment Weekly said, "For every line of howler dialogue that should have been sunk, there's a nice little scene in which humans have to make a difficult decision. For every stretch of generic sci-fi-via-CGI moviemaking, there's a welcome bit of wit." The Washington Post gave the film a three-star rating out of four commenting it is "an invigorating blast of cinematic adrenaline". Roger Ebert of the Chicago Sun-Times gave the film 2 stars out of 4, praising the climax as "an honest-to-God third act, instead of just settling for nonstop fireballs and explosions, as Bay likes to do. I don't want to spoil it for you. Let's say the Greatest Generation still has the right stuff and leave it at that." Battleship was released on DVD and Blu-ray disc on August 20, 2012 in the United Kingdom, and on August 28 in the United States and Canada. Its revenue was $32.4 million. Battleship was released on 4K Blu-Ray on January 17, 2017. 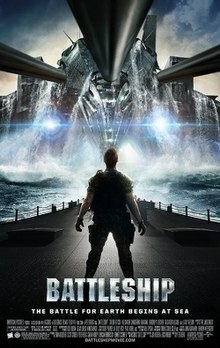 A video game based on the film, titled Battleship, was released on May 15, 2012 to coincide with the film's international release. The game was published by Activision and developed by Double Helix Games for PlayStation 3, Wii, and Xbox 360, and developed by Magic Pockets for Nintendo 3DS and Nintendo DS. Hasbro released several new editions of the classic board game, including an update to the regular fleet-vs.-fleet game and a "movie edition", featuring the alien vessels and a card-based play mode. American Warships, the mockbuster film released at the same time and featuring one of USS Missouri's sister ships, USS Iowa. Under Siege, a 1992 film also set aboard USS Missouri starring Steven Seagal. ^ "Steve Jablonsky Confirmed to Score 'Battleship'". Film Music Reporter. May 31, 2011. Retrieved June 6, 2011. ^ a b c "Box Office Mojo (2012-03-13). "'Box Office Mojo Movie Gross"". Retrieved August 6, 2012. ^ John Gaudiosi (May 30, 2012). "$220 Million Battleship Flop Sinks Not Only Universal Pictures, But Activision Game". Forbes. Retrieved December 27, 2014. Universal Pictures reported a $200 million production cost (unadjusted) excluding advertising budget. ^ "$100m Film Deal Sunk". goldcoast.com.au. March 27, 2010. Retrieved July 10, 2010. ^ Holcombe, Jeremy (September 8, 2010). "First Pictures of Rihanna and Taylor Kitsch on Hawaii Battleship Set". Aloha Update. Archived from the original on September 12, 2010. Retrieved September 13, 2010. ^ "Production Weekly – Issue 715 – Thursday, June 3, 2010 / 125 listings – 26 pages". Production Weekly. Scribd.com (715): 3. June 3, 2010. Archived from the original on July 14, 2010. Retrieved July 27, 2010. ^ "Recent Projects". National Academy of Sciences. Archived from the original on July 26, 2011. Retrieved July 7, 2011. ^ Kyle Mizokami (July 27, 2011). "MSDF in New Hollywood Film, "BATTLESHIP"". New Pacific Institute Project. ^ Rosenberg, Adam (February 18, 2012). "'The Hurt Locker' Star Jeremy Renner In Talks For 'Battleship,' Edgar Allen[sic] Poe's Last Days Thriller". MTV. Retrieved April 24, 2012. ^ a b "Taylor Kitsch to Star in 'Battleship' Film (Exclusive)". The Hollywood Reporter. April 4, 2010. Archived from the original on August 1, 2010. Retrieved July 27, 2010. ^ Winning, Josh (April 8, 2010). "Taylor Kitsch boards Battleship movie". Total Film. Retrieved March 20, 2011. ^ "Liam Neeson Joins Battleship Cast". ComingSoon.net. September 7, 2010. Archived from the original on September 9, 2010. Retrieved September 7, 2010. ^ Benigno, Anthony (July 27, 2010). "Rihanna to make movie debut in 'Battleship' opposite Alexander Skarsgard, Taylor Kitsch". Daily News. Retrieved March 20, 2011. ^ McNary, Dave (July 26, 2010). "Rihanna to star in Universal's Battleship". Variety. Retrieved March 20, 2011. ^ Berg, Peter (April 4, 2012). "Why I cast Rihanna in Battleship". GQ. Retrieved April 24, 2012. ^ Prinzivalli, Fallon (April 3, 2012). "Rihanna Wanted To Be 'Badass,' Not A Love Interest In 'Battleship'". MTV. Retrieved April 24, 2012. ^ "Legless colonel plays self in Battleship". Phil Star. April 14, 2012. Retrieved April 19, 2012. ^ "Pete Berg Interview". View London. p. 2. Retrieved May 12, 2012. ^ Radish, Christina (March 19, 2012). "Brooklyn Decker and Director Peter Berg Talk BATTLESHIP, Naval Warfare and the Design of the Aliens at WonderCon". Collider.com. Retrieved April 15, 2012. ^ Gordon, Mike (November 11, 2011). "Whatever the plot, Missouri has big role in 'Battleship'". Honolulu Star-Advertiser. Retrieved May 16, 2012. ^ Klimas, Jacqueline (May 15, 2012). "Sailors vs. aliens: 'Battleship' debuts Friday". Navy Times. Retrieved May 26, 2012. ^ "Brooklyn Decker and Director Peter Berg Talk BATTLESHIP, Naval Warfare and the Design of the Aliens at WonderCon". Collider. March 19, 2012. Retrieved May 1, 2012. ^ Weintraub, Steve (February 5, 2010). "Peter Berg's Battleship Is Now Sailing Memorial Day Weekend 2012". Collider.com. Retrieved July 10, 2010. ^ "Battleship (2012) - International Box Office Results". Retrieved September 6, 2012. ^ Finke, Nikki (March 13, 2012). "'Battleship' Builds $25M Foreign War Chest". Deadline.com. Retrieved April 14, 2012. ^ a b McClintock, Pamela (March 14, 2012). "Box Office Report: 'Hunger Games' Edges Out 'Three Stooges,' 'Cabin in the Woods'". The Hollywood Reporter. Archived from the original on April 14, 2012. Retrieved April 14, 2012. ^ Segers, Frank (March 15, 2012). "Foreign Box Office: 'Titanic 3D' Unsinkable No. 1 Overseas After Sensational China Debut". The Hollywood Reporter. Retrieved April 16, 2012. ^ Subers, Ray (April 24, 2012). "Around-the-World Roundup: 'Battleship' Sinks 'Titanic'". Box Office Mojo. Retrieved April 26, 2012. ^ Gant, Charles (April 17, 2012). "Battleship cruises to top of UK box office charts". The Guardian. Retrieved April 24, 2012. ^ Finke, Nikki. "BOMBS AWAY! 'Battleship' Sinks To $25.3M Torpedoed By Still Strong 'Avengers'; Lame 'What To Expect' Behind Limp 'The Dictator'". deadline.com. Retrieved May 25, 2012. ^ Subers, Ray. "Weekend Report: 'Battleship' Drowns Under Weight of 'Avengers'". Box Office Mojo. Retrieved May 25, 2012. ^ "Box Office Report: 'Battleship' Torpedoed With $9.1 Million Friday". The Hollywood Reporter. Retrieved May 19, 2012. ^ Young, John. "Box office report: 'The Avengers' crushes 'Battleship' and 'The Dictator' with $55.1 mil". Entertainment Weekly. Retrieved May 22, 2012. ^ "Battleship". Rotten Tomatoes. Fandango. Retrieved September 29, 2018. ^ a b Lehmann, Megan (April 11, 2012). "Battleship: Film Review". The Hollywood Reporter. Retrieved April 18, 2012. ^ a b de Semlyen, Nick. "Empire's Battleship Movie Review". Empire Magazine. Retrieved April 17, 2012. ^ a b Hardie, Giles (April 12, 2012). "Battleship movie review". The Sydney Morning Herald. Retrieved April 18, 2012. ^ Di Rosso, Jason (April 12, 2012). "Battleship". MovieTime. Radio National (Australian Broadcasting Corporation). Retrieved April 18, 2012. ^ Andrew Harrison (April 11, 2012). "Film review – Battleship: This brainless Rihanna vehicle deserves to be scuttled without delay". Q. Archived from the original on April 19, 2012. Retrieved April 30, 2012. ^ Turan, Kenneth. "Movie review: Aliens can have this 'Battleship'". L.A. Times. Retrieved May 20, 2012. ^ Steven James Snyder (May 17, 2012). "Battleship: More Fun Than a Board Game Blockbuster Has Any Right to Be". Time. Retrieved May 18, 2012. ^ Schwarzbaum, Lisa (May 16, 2012). "Battleship Review". Entertainment Weekly. Retrieved May 18, 2012. ^ Righthand, Jess (May 18, 2012). "'Battleship' and more new movies". The Washington Post. Retrieved May 18, 2012. ^ Ebert, Roger (May 16, 2012). "Battleship". RogerEbert.com. Archived from the original on January 12, 2014. Retrieved January 11, 2014. ^ Carolyn, Giardina; Jordan, Zakarin (December 3, 2012). "Disney Leads Annie Award Best Picture Nominations". The Hollywood Reporter. Prometheus Global Media. Retrieved December 8, 2012. ^ "The 13th Annual Golden Trailer Awards". Goldentrailer.com. Archived from the original on December 7, 2012. Retrieved December 8, 2012. ^ "2012 Houston Film Critics Nominees - Winners". Texasartfilm.com. Archived from the original on March 21, 2015. Retrieved January 10, 2013. ^ Bibbiani, William (January 8, 2013). "The 33rd Annual Razzies (Dis)-Honor Twilight: Breaking Dawn: Part 2". CraveOnline.com. Retrieved January 9, 2013. ^ Daniels, Colin (February 24, 2013). "Twilight Breaking Dawn - Part 2, Kristen Stewart, Rihanna win Razzies". Digital Spy. Retrieved February 24, 2013. ^ "39th Annual Saturn Awards" (PDF). Academy of Science Fiction, Fantasy & Horror Films. Archived from the original (PDF) on February 20, 2013. Retrieved February 20, 2013. ^ "Teen Choice Awards Winners 2012: 'Twilight,' 'The Vampire Diaries,' Justin Bieber Win Big". The Huffington Post. June 23, 2012. Archived from the original on November 3, 2012. Retrieved June 23, 2012. ^ Scott, Mike (January 8, 2013). "Baton Rouge-shot 'Battleship' nominated for visual effects award; plus more movie briefs". The Times-Picayune. Retrieved January 24, 2013. ^ "Battleship on Amazon". Amazon.co.uk. Retrieved May 26, 2012. ^ "Battleship Blu-ray". Blu-ray.com. Retrieved September 6, 2012. Wikimedia Commons has media related to Battleship (film). Films set in Washington, D.C. This page was last edited on 23 April 2019, at 21:30 (UTC).